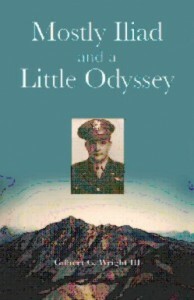 The author was a young law school student in Texas when World War II began and he joined the Army Air Corps in January 1942 and became a pilot. He joined “Project X” not knowing that this entailed flying C-46’s to supply the Flying Tigers and their Chinese support troops in China — “flying the Hump”, as it was called. And it was one of the most dangerous assignments he could have found; during the three years of operation, more than 600 aircraft and nearly 1000 aircrew were lost on the 500 mile route. After the war, Wright became a lawyer with Forest Oil Company in Corpus Christi and San Antonio. In 1993 he bowed to the request of his family and wrote this memoir of his adventures in the Burma-India theatre, and it is now reproduced for the benefit of friends and family.